I remember watching a review of Village and being utterly curious. It was unlike pretty much anything I’d seen before and I desperately wanted to know more. It looked a little more complicated than I was used to at the time, and perhaps a little slower, but the theme and the mechanics stuck out so vividly. My wife ordered it as a surprise – no birthday or other reason, just because she is lovely like that – and a few days later I picked up the box from the post office on my way to work. It sat in the boot of my car all day, my curiosity rising. That evening my wife opened the parcel and revealed what she’d bought. We looked at it quickly, wanting to break the cellophane and delve right in… and then we put it away and prepared for a weekend visit with my brother and his girlfriend. A day of curiosity, a weekend of longing, and then back to work. In Village you play a family dynasty, supervising four generations of your clan through their lives and ushering the older members quietly, and sometimes quickly, to their final resting places. It’s all in the quest for slightly abstract points but that really doesn’t matter when the theme is this strong. Send your family members to market, into government, or even the church, in a quest to increase your standing. Train them to make ploughs, breed horses or pack them off out into the wider world to make their fortune. The initial impression is of a quaint, pastoral game but further inspection reveals a streak that’s more bubonic than bucolic. 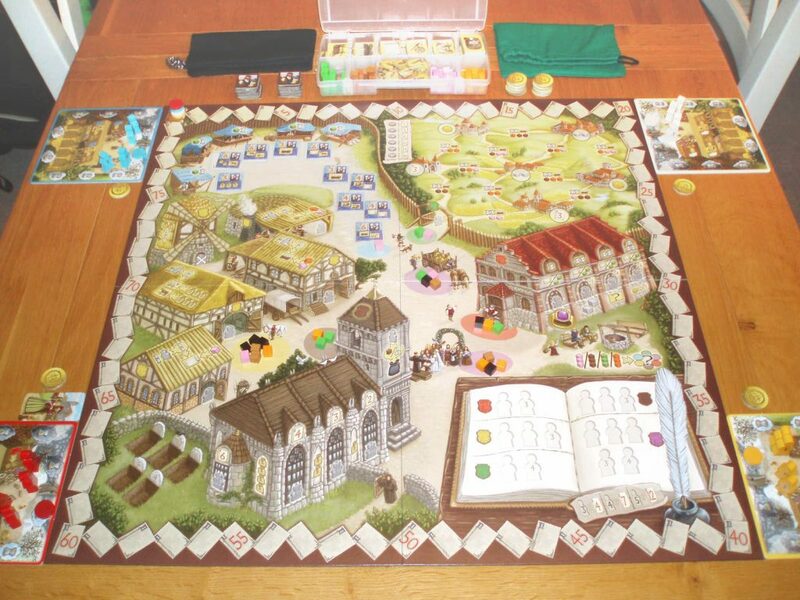 Welcome to the Village – a four player game ready to begin. You see, almost everything you do costs you time, time that ticks ever onwards and when the clock tolls your oldest family member dies. They could be an expert craftsman or leading the village council and then just like that they drop down dead. The game’s plague cubes cost you more time, further hastening grandpa’s demise. As you reach the mid-game it’s not unusual to find your clan are dropping like flies and that the careful network you’ve set up of builders and traders is collapsing around you. Perhaps bumping a few relatives off wouldn’t be so bad. After all, the dead can earn your family prestige as well. You earn points throughout the game by selling goods, working in government, exploring and so on, but a great swathe are also awarded at the end via the village chronicle. The chronicle records the deaths of the notable. The more corpses in the chronicle you have, the more points you get. The trouble is, there’s only so much space within its pages and the different occupations each only have a portion of the places. Aunty Claire might be an authority when it comes to politics but if the council chamber section of the chronicle is full when the last grain of sand falls through her hourglass then she’ll end up in the church graveyard, her death literally pointless. Sometimes then it’s better to snuff them out earlier to snap up those precious spaces. Since the number of bodies also acts a timer you can additionally try to manipulate the reaper to end the game when it’s most convenient for you. Death or glory? Aim to score high by landing your family members in the Village Chronicle rather than the church graveyard. There’s no denying there’s a lot going on here but once you’ve got over the rules hump it actually all flows together smoothly. At the start of a round the board is seeded with different coloured cubes and on your turn you take a cube and do the action associated with it if you want. As a result turns pass by quickly, giving the game a lighter feel than it initially seems. The cubes themselves can be used to activate different careers, adding another layer to the decision of which cube and resulting action to take. There’s a reason it won the 2012 Kennerspiel des Jahres – the leading board game authority’s connoisseur’s game of the year. The mechanisms are smart and innovative and it all interlinks, each distinct area feeding back into the overall game itself. Despite its weight it’s remarkably sprightly and that theme – it runs through the whole game like words through a stick of rock. Ah, home sweet home… just ignore the death clock around the perimeter! 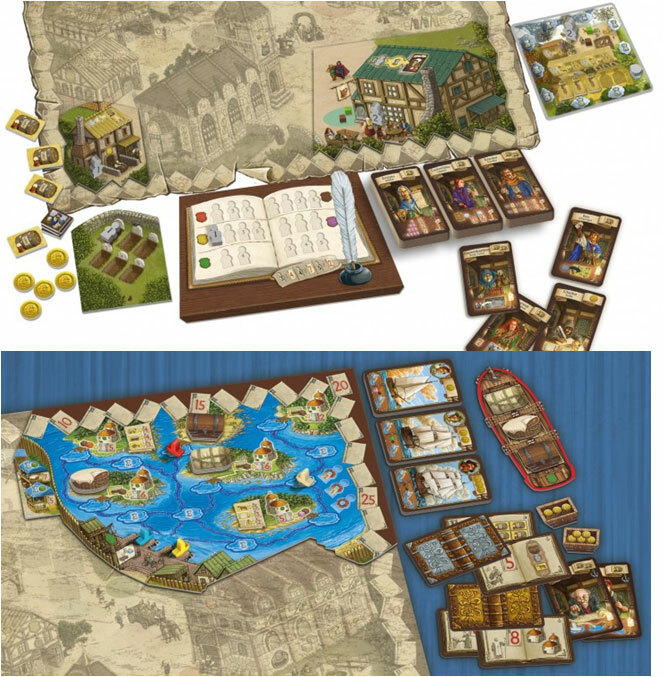 There are two expansions for it too, adding first an inn and brewery and later a port. We don’t actually own Village Port. I’m worried that the additional mechanisms might overload the game and therefore whether it would get much use in our household. I’ve actually seen it in the wild, sitting on a shelf in a Keswick shop in the Lake District. It’s a curious shop, designed to cater to tourists whatever the weather and stocking a mix of camouflage clothing, knives and air rifles alongside puzzles and toys. There’s a single small aisle of board games, a mix of the old classics and the most popular modern contenders. There are even a couple of expansions for the wildly successful Carcassonne. Why on earth there’s an expansion for Village there I have no idea, it doesn’t seem like something that would be in high demand. This is borne out by the fact that we’ve seen it on two consecutive annual holidays to the Lake District. If it’s there a third time I’ll buy it, partly just to put whoever ordered it in the shop out of their misery. If that sounds like I’m being snobbish, as if nobody in the lakes would be in the know enough to want to buy the port expansion, that’s not what I mean. There are undoubtedly gamers in the area and it could be an important shop for the local scene. But expansions are only bought by those people who’ve already own the game and Village, despite its awards, isn’t exactly found in your local supermarket or bookstore. I think that sums up the game, it’s not for everyone. Even with the possibility for lithe turns it still can be slow and ponderous – there’s a lot to consider and you can spend a while doing just that. The theme is simultaneously too cutesy for some and offputtingly dark for others. The coloured cubes can be confused in low light and could be especially difficult for the colour-blind. 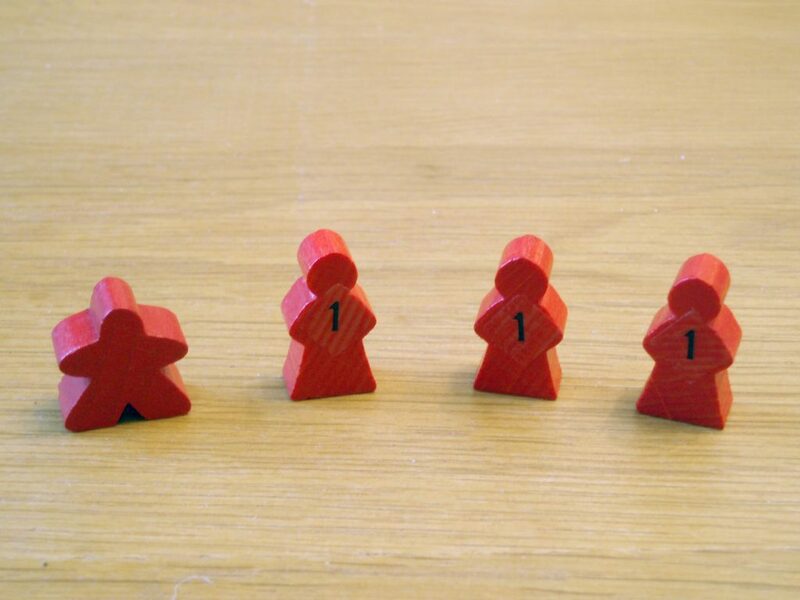 Despite its clan-based theme, it’s not exactly a family-friendly game and the initial rules explanation can be a struggle for anyone not used to modern board games. All this doesn’t make Village any less special but it does mean that it’s not a game I break out all the time. Inn the Navy! The two expansions add overlays to areas of the board, just try not to spend too much time lining them up. The first expansion though, Village Inn, is exceptional. The rumour is that it was originally meant to be part of the main game. I have mixed feelings about this: it indicates how brilliantly the expansion works with the base game but I feel almost like we were cheated not to have it included in the first place. Instead we have to slide pieces awkwardly on top of the old board and the chronicle and graveyard end up off to one side. It’s hard to grumble though when an expansion is this good. It works. You get another craft space in the form of the brewery and you can send your family members for a drink in the pub. Like in real life, you can meet all sorts in the pub and the other clientele give you special bonuses that help mid-game or provide scoring goals to aim for. The effect is an electric charge right to the very spine of the game, providing additional ways of scoring big without diluting or slowing the rest of the game in anyway. Well worth it, even if it does add to the rules explanation. 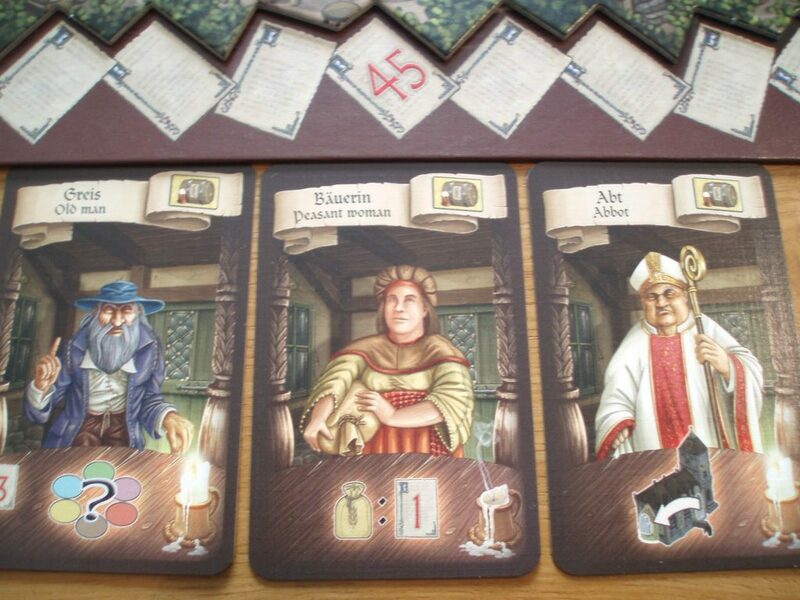 You’ll meet all sorts in the Village Inn: Old men, Peasant women and… abbots? There’s another thing about the inn that I feel illustrates the charm Village has to offer: clientele of the inn don’t get a mention in the chronicle. The drunken uncle that dies mid-pint is not scribbled down and recorded for posterity, he ends up rotting worthlessly in the graveyard. Again, I’m coming back to theme here but it’s all about the interaction between theme and mechanics. It’s not enough to have an exciting theme or an innovative mechanism. The truly magical games need the two to be linked hand in hand, so tightly interwoven that it’s hard to tease them apart. Village achieves this enchanting knit-work, providing a game that’s packed full of interesting quirks and a richness to its story-telling balanced with a depth of gameplay that’s difficult to achieve. 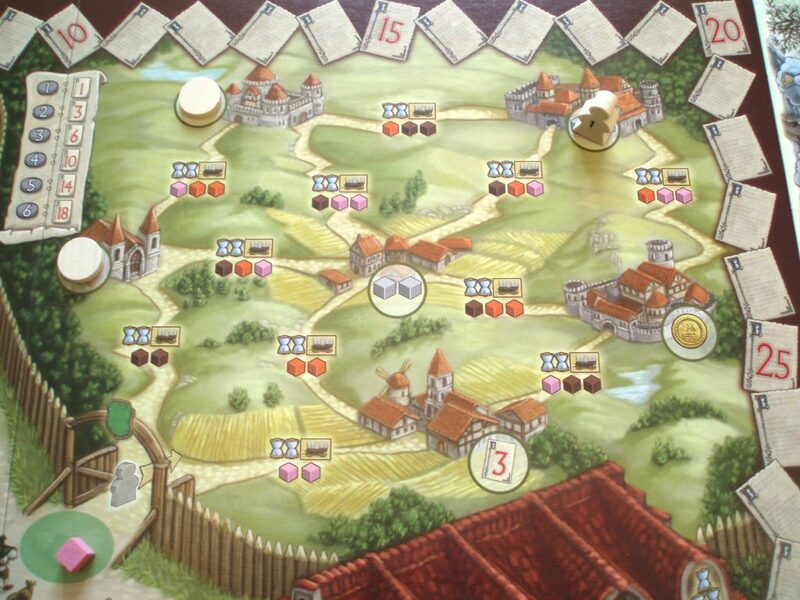 To talk in Board Game Geek terms briefly, Village offers a number of different ways to score points (a point salad) and routes of development that interlink to provide greater rewards (engine-building). But what makes Village stand out is that mechanistically you aren’t just building an engine to ride to victory and you aren’t specialising on a particular area of the game for maximum points. Those typical strategies falter because your gears keep dying. You could retain a single-minded determination to continually repair and replace but the game gives you enough family members to play with and enough careers to send them careening towards that it’s often more profitable to just let an engine peter out. These point-spewing engines in Village can grow, branch off and decompose, allowing the surviving components to be rebuilt in different configurations. It’s all so organic. Go West… or in this case the direction you can send your family member in is mostly east. This sensation of fluidity also makes it important to be aware of what’s going on around the table too. There isn’t a huge amount of player interaction in the game but since everything you do is built on mortal flesh you need to be agile and flexible, able to react to the actions of your opponents throughout the game. The in-game timers of the chronicle and graveyard mean that ignoring your opponents results in a game ending when you simply aren’t prepared. To succeed at Village means being acutely aware of those people at the table with you. In many ways it’s like a silent disco, everyone is doing their own dance to their own music but all need to be alert to the other people gyrating around them in order to avoid a collision. It’s fun to stay in the Y-… aw come on guys! 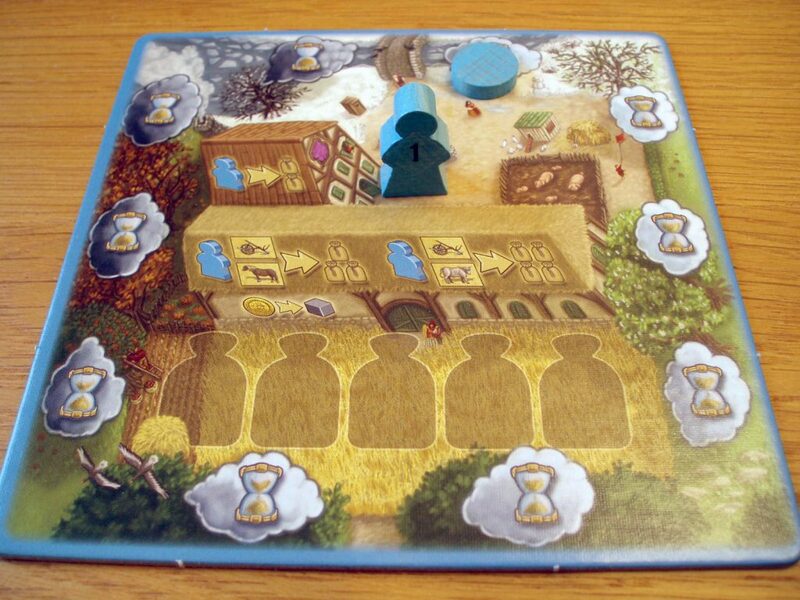 The Village Meeple look slightly less enthusiastic about things compared to everyday meeple. I like games that tell stories and games that encourage players to experience a range of emotions. There are times when I’m genuinely upset when one of my little meeple pops its clogs, taken before her time. It’s earthily satisfying when a father crafts a plough allowing a son to harvest more grain. The travelling cousin may still be visible on the board yet she feels remote and distant as if actually estranged. I’ve laughed when three generations of the same clan all join the church in a single familial mass initiation. For a game of such ancestral scope it’s incredibly personal, celebrating the cosy details whilst weaving its tales across decades. It’s not a game I reach for all the time but that almost increases its meaning to me, somehow making it more precious. When I see the box upon our shelf I think of my wife and surprise presents, I remember the emotional highs and lows of previous games and I contemplate what tales might be spun during my next trip to the Village. Previous postSkyward Review – I Split. You Choose. We All Float. Great review! Only played twice, once without the Inn, and once with, but it’s quickly becoming a top favorite of mine.